About seven pieces of nice majolica is part of the Decorative Arts & Design. 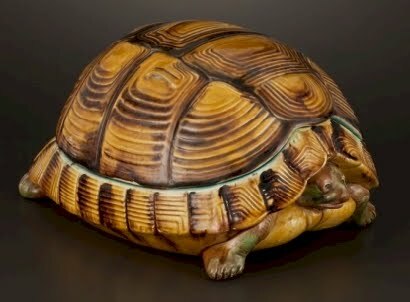 An tortoise cuspidor, attributed to George Jones & Sons, Stroke-on-Trent, Staffordshire, England, circa 1870. The tortoise form cuspidor with light blue to interior surfaces. Attributed to George Jones & Sons: .